also seen on the VTC-5000II The Titan VCR-2000 was a direct clone of the Sanyo VTC-5000 II. 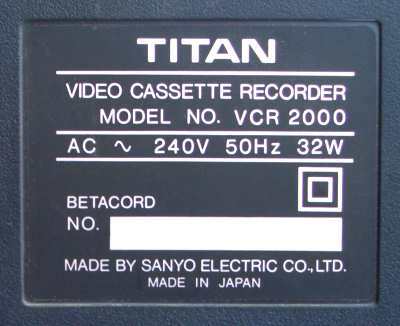 Both Titan and Sanyo described their VCR system as Betacord not Betamax. Cosmetically it was a stylish looking top loader for its day. Features included were a 7 day 1 event timer, picture search and pause (albeit in monochrome). 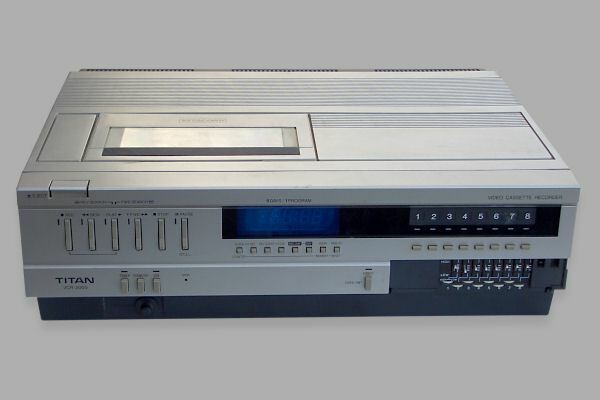 The VCR 2000, based on the 5000, used a redesigned mechanism from earlier Sanyo models such as the VTC-5300. It was remarkably light weighing only 8 kgs compared to 15.5 kgs for the Sony SL-C7. Also it incorporated the latest power-saving ICs which met it consumed only 29W, compared to 45W for the SL-C7. Sanyo also reduced the number of mechanical solenoids in this model to none. Instead the loading motor carries out all the mechanical operations needed. 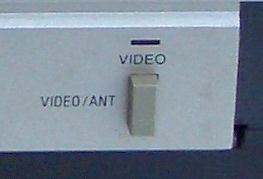 Another unique feature of this VCR was that it unthreaded the tape and returned it into the cassette shell before performing winding. This is something which is the same as the rival VHS system. Like the VTC-5000 II, it also had an additional button on the front panel for a line in selection. It shared its colouring though more with the VTC-5000. Both versions are very similar to the VTC-5150, which was an up market version of the VTC-5000 and included colour in picture search modes / pause and a reverse play mode.